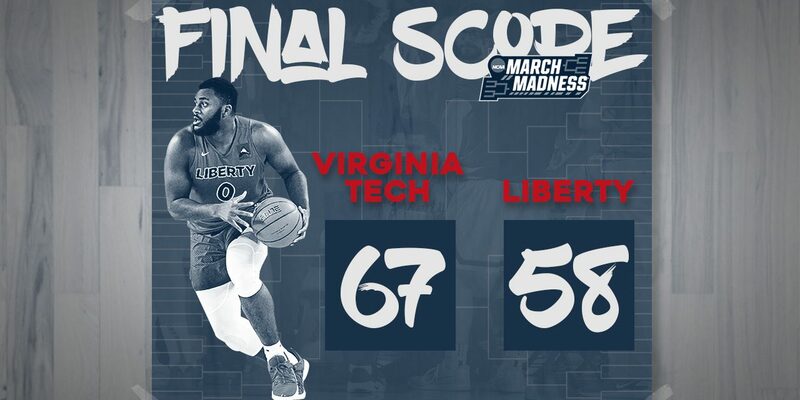 Liberty’s historic season would come to an end Sunday night, falling to Virginia Tech, 67-58, in the 2nd round of the NCAA Tournament. With the loss, the Flames’ best season in school history concludes at 29-7. The Hokies advance to the Sweet Sixteen where they will face the number one overall seed Duke. Both teams opened the game a bit slowly offensively, as the Flames and Hokies were just trying to feel each other out in the opening minutes. Virginia Tech would open up to a 4-0 lead before Lovell Cabbil got a mid-range jump shot to fall. 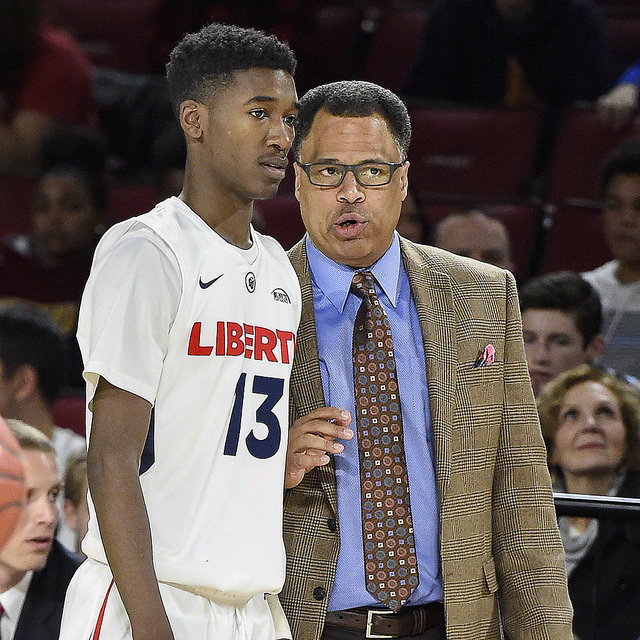 Just like the first round game against Mississippi State on Friday night, the Flames’ bench came in and provided an immediate spark as Darius McGhee and Keenan Gumbs knocked down open three pointers, each giving Liberty a 1 point lead. McGhee continued his hot shooting as the true freshman knocked down three triples, giving Liberty a 21-17 lead at the 6:39 mark. The Flames’ defense was also at a great level early, forcing Virginia Tech into tough shots early. The Hokies were shooting just 32% from the floor and only 1-of-5 from 3 by the under 8 media timeout. McGhee hit his 4th three-pointer and Caleb Homesley got a runner to push the Flames lead to 26-18 with 4:25 left in the first half as Buzz Williams rushed onto the floor to call timeout. 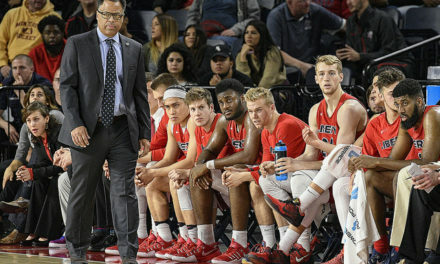 Liberty had Tech frustrated with their stifling defense and hot 3-point shooting. Justin Robinson also had to head to the bench with 2 fouls. The only thing keeping the Hokies within single digits late in the first half was their offensive rebounding. It took Kerry Blackshear 10 shots, but he was able to get 6 points, all 2nd chance, to keep Tech within 6 points by the under 4 media timeout. Virginia Tech was shooting just 29% from the floor. The Hokies went on an 8-0 run to tie the game at 26 before Georgie Pacheco-Ortiz ended the run with an old fashioned 3-point play and Keenan Gumbs hit his 4th straight 3-pointer in the NCAA Tournament, his 2nd of the game. Tech would respond with a 3-pointer by Ahmed Hill to close the half, Liberty leading 32-29. Liberty shot 48% from the field and 7-of-18 from 3 in the first half while the Hokies were limited to 36% field goal shooting. Virginia Tech owned the advantage on 2nd chance points, 7-0, and points in the paint. Scottie James only played 6 minutes in the first half as he picked up two fouls early. Starting with Hill’s 3 to end the half, Virginia Tech went on an extended 10-0 run to take a 4 point lead at 36-32 in the opening minutes of the 2nd half. Senior Lovell Cabbil ended that run with a bucket and a foul which sparked a Liberty 7-0 run as the Flames regained the lead at 39-36 by the first media of the 2nd period. Myo Baxter-Bell again provided a great boost off the bench as Scottie James continued to struggle. He would make a pair of free throws after the timeout to extend the run to 9-0. It was a game of runs as Virginia Tech went on a 9-0 run to push the lead to their largest of the game at 50-44 with 11:13 to play. Tech opened the 2nd half making 4-of-6 three pointers. The Flames turned the ball over 4 times in a span of about 5 minutes during the heart of the 2nd twenty minutes as Virginia Tech pushed the lead to 8. McGhee would end the long Tech run with a straight-away three at the 9:07 mark to cut the Hokies lead to 52-47. It was Darius’ 5th three pointer of the game, as he had a team-high 15 points. The Flames would go on an extended drought, more than 4 minutes without a point. During the stretch, Liberty made just 1-of-12 shots, as Virginia Tech pushed the lead to 7 with 3:26 left to play. Liberty was too content settling for long jump shots as opposed to attacking the paint and getting some close looks. Not helping matters, Scottie James continued to be a non-factor. The first-team all-conference performer struggled all night, following a less than stellar first round performance Friday night. Liberty never got closer than 5 in the closing minutes as the Flames were cold all 2nd half from the field. Virginia Tech went on to the win, 67-58, to advance to the Sweet 16 to face Duke on Friday in Washington, DC. After shooting nearly 50% from the field in the first half, Liberty was just 6-of-22 (27.3%) from the field and 3-of-13 from 3. McGhee was the only Flame to reach double figures, scoring 15 points on 5-of-11 shooting from 3. It was the true freshman’s best game since early January against FGCU. Scottie James had his 2nd straight under performing game in the NCAA Tournament, finishing with 4 points and 5 rebounds in just 14 minutes. Caleb Homesley, who was electric on Friday, struggled from the floor against the Hokies. He finished with 8 points on 3-of-11 shooting and 1-of-7 from 3. He did grab a team-high 9 rebounds. Virginia Tech dominated in points in the paint, 30-10.